Peppers are among the most delicious, healthy and versatile vegetables that you can offer your family. They can be added to almost anything and will liven up even the most mundane meals. Growing peppers saves quite a bit of money, but these tropical plants will not do well in every region. 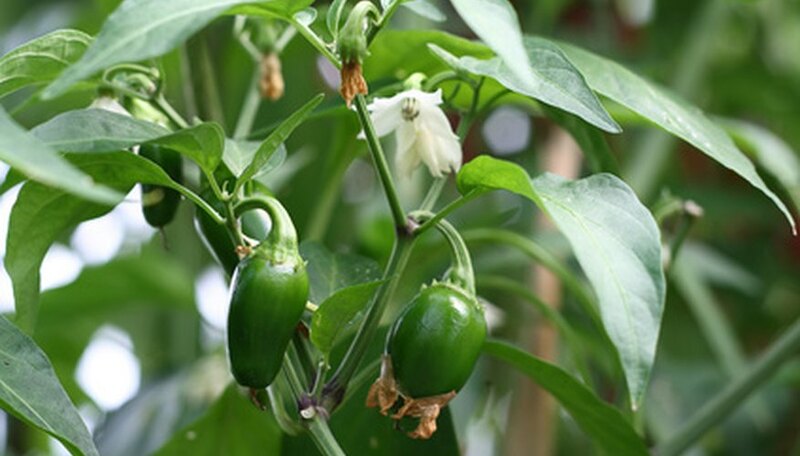 If you live in a location that has a short growing season, get a head start and increase your pepper yield by growing the vegetables in a greenhouse. Fill a 3-inch growing container three-fourths of the way with potting soil. Place two pepper seeds on top of the soil and cover with 1/4-inch of the potting mixture. Add enough water to moisten the soil well. Cover the container with a piece of black plastic and place it in a location that maintains a temperature of about 66 degrees F.
Check the pots daily to see if they need to be watered. Add moisture only when the soil no longer sticks to your finger. The seeds should sprout in 15 to 20 days. Pull up the weakest looking seedling in each cup. Move the pots to the greenhouse when outdoor temperatures will dip no lower than 54 degrees F.
Transplant the seedlings to larger pots once they reach 2 to 3 inches tall. Fill an 8-inch growing container with potting soil and plant the seedling, taking care to place it at the same soil level as it was originally growing. Water whenever the top inch of soil feels dry. Feed the young plants once each week with a general purpose fertilizer mixed at half strength. Fertilize the plants once each week with liquid tomato fertilizer after peppers begin to develop. Examine each plant to see how many fruits are developing. If there are more than 8 small peppers for each plant, gently remove the excess with a sharp knife. This will promote larger fruit development. Harvest the peppers when they reach the desired degree of ripeness. Start peppers indoors in mid-March. If the pepper variety that you planted will grow more than 3 feet tall, place a bamboo stake in the pot at the time of transplanting. Use garden twine to attach the stem to the stake, which will prevent breakage as the plant grows. Harvest peppers using a knife instead of pulling them from the plant to prevent damage. Do not transplant the seedlings to the greenhouse too early in the season because it can cause the developing fruits to be flat.